A Transfrontier Conservation Area (TFCA) is defined as a component of a large ecological region that straddles the boundaries of two or more countries encompassing one or more protected areas as well as multiple resource use areas. The Kavango-Zambezi (KAZA) TFCA lies in the Kavango and Zambezi river basins where Angola, Botswana, Namibia, Zambia and Zimbabwe converge and covers some 519 000 sq. kilometers. It was formalized in December 2006 when a memorandum of understanding was signed by the respective governments. The goal of the KAZA TFCA is “To sustainably manage the Kavango Zambezi ecosystem, its heritage and cultural resources based on best conservation and tourism models for the socio-economic wellbeing of the communities and other stakeholders in and around the eco-region through harmonization of policies, strategies and practices.” Safari hunting is an integral part of the economic model. Within this area is the Hwange-Sanyati Biodiversity Corridor (HSBC) project, 14 million acres in extent. The $6.4 million project is being funded by the Global Environment Facility (GEF) and is running from 2014-2019. The World Bank is the implementing agency for the project, the Worldwide Fund for Nature (WWF) is the activities implementing entity and the Ministry of Environment and Natural Resources Management is the coordinating authority. Key project partners are: Parks and Wildlife Management Authority; CAMPFIRE Association; Environmental Management Agency; and the Forestry Commission. Inadequate institutional capacities to address environmental and livelihood challenges. The Hwange Communal Area is a part of the country’s CAMPFIRE project and includes the Sidinda area which borders the Zambezi River. The hunting safari outfitter operating in this region is Mbalabala Safaris, owned and run by Lindon Stanton and Tinie Kok. When they took over the hunting area in 2014 they realized that certain key species would have to be re-introduced in order to improve the viability of the area. A fenced, protected core area would have to be established before wildlife could be brought in. Once wildlife populations stabilized the next phase of the project would involve erecting a second, lower cattle fence encompassing 100 000 acres into which the game could move. The idea was presented to the Hwange Rural Council who were very supportive as was Charles Jonga, head of CAMPFIRE Zimbabwe. The Zimbabwe National Parks and Wildlife Management Authority was contacted, and an ecologist was sent to undertake an ecological assessment of the area. The results showed that 100 buffalo, 30 sable, 30 zebra, 30 eland and 30 waterbuck could be sustained within the proposed 9 000 acre enclosed area. The success of the plan would hinge on the local people realizing tangible benefits from the project. This would come in the form of cash from trophy fees and meat from the hunted animals. The rural council undertook a PR exercise across the region to inform the various communities about the proposed scheme. With financial support from their hunting clients Lindon and Tinie hired 40 people from the local community and began erecting the fence. The terrain in the area is formidable and It took two years of hard work before the 14-kilometer-long fence was completed. Two strands of solar-powered electrified wire were attached to the fence. The first 3-foot high strand was placed on the inside of the fence to keep buffalo from breaking out. The second strand was set at 5 feet on the outside to deter elephant from breaking down the fence. Whilst the fence was being erected Lin and Tinie located a potential source of buffalo. 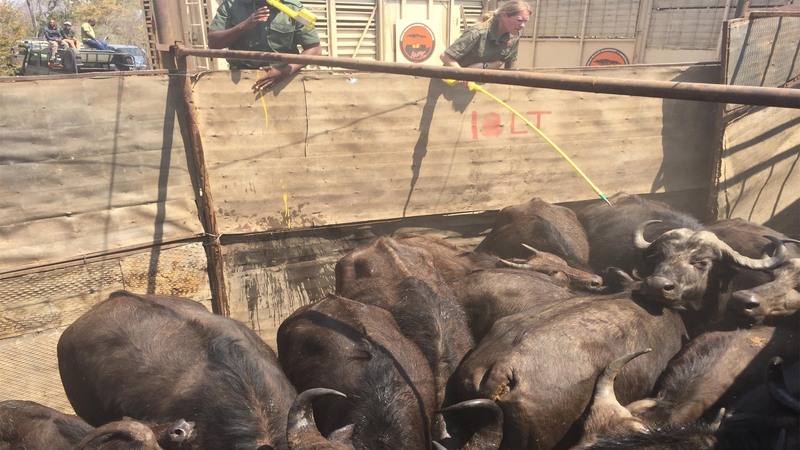 A fenced area of the Victoria Falls National Park had an over-population of buffalo and at least 100 needed to be removed as grazing had become a problem. A deal was made between CAMPFIRE, Hwange Rural Council and the National Parks authorities to move 100 buffalo from the park to Sidinda. The African Wildlife Management and Conservation capture unit under Nicholas (NJ) La Grange was commissioned to capture and translocate the buffalo. The operation took a couple of days and the buffalo were released into an enclosed boma within the core area so as to acclimatize them. Supplementary food was brought in and fresh water pumped into troughs. After a month in the boma the buffalo were released into the core area. Under favorable conditions buffalo numbers build up very quickly and the hope is that within a couple of years they can be pushed out into the larger area. The next stage of the project is to re-introduce the other proposed wildlife species into the core area. One of the problems associated with hunting concession leases in many parts of Africa is the length of tenure. Safari operators are reluctant to invest time and money into an area only to lose it to another operator after a few years. Lindon and Tinie approached the Hwange Rural Council with a plan to increase the length of their lease from 5 years to 15 or 20 years with a progress review every 5 years. The council agreed and Lindon and Tinie are confident that their plan to rehabilitate the area will succeed. The Sidinda rehabilitation project is a refreshing one amidst the general doom and gloom surrounding the state of Africa’s wildlife and wilderness.